Sell-side debt capital markets firms are forced to focus on risk and compliance at the cost of capital commitment and liquidity. Boston, September 10, 2014 – Many U.S. regional banks and broker-dealers are finding today's debt capital markets to be an exercise in high cost and low return, and market dynamics are bifurcating the largest global banks and asset managers from their smaller brethren. 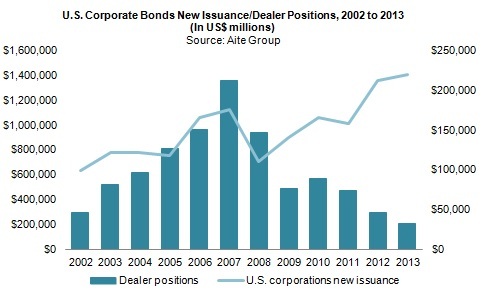 This has left smaller fixed income investors and debt capital markets firms searching for profit and liquidity. In an environment that forces firms to decide which fixed income markets they are willing and able to commit to, what are firms to do about their debt trading operations? Based on phone interviews and face-to face meetings with market participants, this piece takes on multiple fixed income product lines, market structure, evolving market dynamics, and the push for electronic trading; it also covers the market relationship between the sell-side and buy-side with regard to market liquidity, capital commitment, and the disparity between the two. This 22-page Impact Note contains 13 figures and four tables. Clients of Aite Group's Institutional Securities & Investments or Wealth Management services can download this report.